"The MakerLab at Cornell Tech needs your help," says Carter Burden Network Outreach Coordinator Yulisa Santana. "Challenges (ideas) are being solicited from older adults for products that would make their everyday lives easier." Grad students and entrepreneurs at Cornell Tech's Roosevelt Island Campus want you to fire up their creative engines. "Six challenges appropriate for this workshop will be chosen," says Santana. 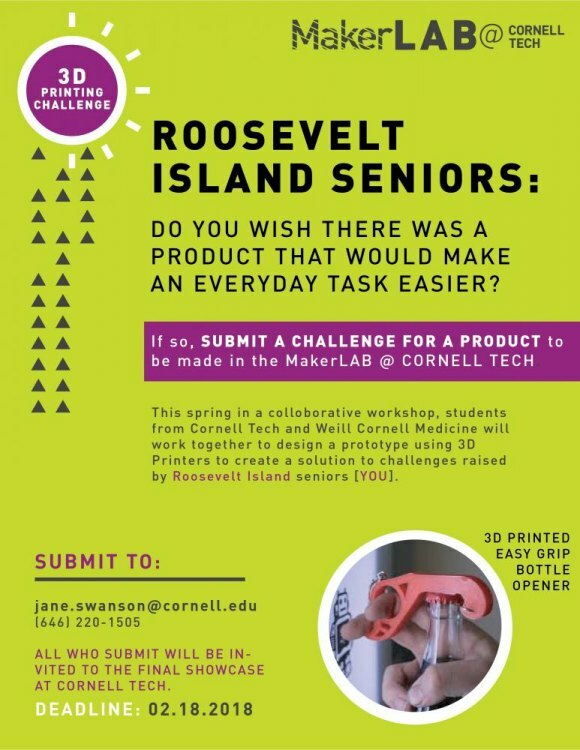 "If you have a challenge you would like to see prototyped, please submit it via email to Jane.Swanson@cornell.edu or call Jane at 646-220-1505. The deadline to submit challenges is February 18th." This promises to be a great experience with Roosevelt Islanders inspiring some of the best young minds on the planet to come up with innovative solutions that just might change the world.